Chris and Bec Judd have recently returned from a swank family holiday. Suffice to say the trip home provided a sharp contrast to the relaxing days that preceded it. Because spew. Also poo. Planes and kids don’t go together like love and marriage or a horse and carriage, which seems unfair, but it is what it is. The Judd’s had this reality rudely brought home to them very recently, as they headed back to Melbourne with four lovely kids in tow. Bathed in an exhausted but joyful post-Queensland-vacation glow, things went pear-shaped very quickly. Bec chatted to her The 3pm Pick-Up co-hosts about the series of unfortunate events that created a delight-to-disaster sort of domino effect for her family. “We had actually the worst flight ever on the way home,” Bec confirmed, obviously traumatised, glow officially stolen. It all started with the poor man sitting in the next row. 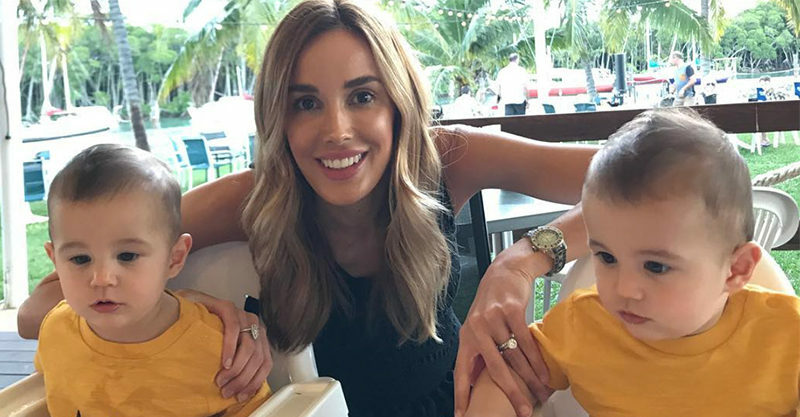 “Halfway through the flight and the gentleman behind me had a medical emergency, so he fainted and it wasn’t looking good – he was quite grey,” Bec explained. The acrid odour triggered a regrettable sympathetic reaction – and bout of homesickness – in her littlies. Uh-oh. Ugh. When vomit attacks, pretty much. “It was on my legs and on my husband and on my mum,” Bec explains, the moment seemingly playing out again in her head like a broken record. But it doesn’t end there. “My other twin, Darcy, decides he’s got diarrhoea, so my husband has to go into this little plane cubicle and change him,” she recalls. No, Darcy! Nooooo! Abort! Abort! Ouch! Things have reached fever pitch at this point. Whites of eyes are flashing. We’re at peak NOPE. I mean, who wouldn’t want to be photographed in all their pukey, poopy, air-freshened glory after a disaster flight? What a treat. “It was actually a nightmare!” a rattled Bec summed up. “In future holidays I’m never leaving Melbourne,” she said firmly, perhaps still washing the vomit from the formerly optimistic bits of her psyche. Have you ever endured a nightmare flight like this with your kiddos?